Focal has unveiled a new speaker system tailored for those who want to enjoy 3D Atmos sound in a compact, easy-to-install package. The new Dôme Flax 5.1.2 system adds two 300 Series ICW-4 in-ceiling speakers to Focal's previous Dôme Flax ensemble, which includes five matching Dôme Flax speakers and the Sub Air wireless subwoofer. All seven speakers use the same tweeter and the same four-inch Flax woofer, and Focal has completely redesigned the installation process for the ICW-4 in-ceiling speakers to make it easier. The 5.1.2 system price is $2,499, and you can add extra Dôme Flax or ICW-4 speakers for $399 each. Focal announces the company's new flagship in the Home Cinema range, Dôme Flax 5.1.2, a Dolby Atmos compatible speaker system. Building off the already impressive Dôme Flax 5.1 channel speaker system which features the company's Sub Air wireless subwoofer and five matching Dôme Flax, this new offering adds two 300 Series ICW-4 speakers to mount in the ceiling and enable the Atmos effect when combined with an Atmos enabled AV receiver and appropriate content. This pack combines compactness, seamless integration and high acoustic performance, thanks to two new discreet in-neiling speakers for a 3D sound experience. Users can now enjoy an experience worthy of cinemas equipped with Dolby Atmos in the comfort of their home, thanks to this easy-to-install system. This new system can generate the spatial and acoustic realism found in Dolby Atmos content while offering remarkable neutrality and dynamics, as well as Focal's signature acoustic sound profile. "Dolby Atmos offers true 3D sound by including another dimension coming from above," said Ben Jensen, president of Focal North America. "With the inclusion of two of our ICW-4 in-ceiling speakers with the standard 5.1 speaker package, the original Dôme 5.1 system has been given a new level of precision and realism for a multichannel experience worthy of cinemas." In order to get the most accurate sound profile out of this system, Focal decided to harmonize all of the speakers composing the Dôme Flax 5.1.2 pack. The included ICW-4 in-ceiling and Dôme Flax speakers use the same tweeter, as well as the same 4" (10cm) Flax woofer. While Dôme Flax works in closed enclosure, the 300 Series ICW-4 were designed to work in an open baffle. In fact, the voice coil, the speaker surround and the spider of the woofer have been modified for this use. These Dôme loudspeakers feature flax cones manufactured in Saint-Etienne using flax grown in France. This natural material is both light and rigid, and is capable of very high performance, particularly in terms of damping and sound propagation. The result is a more homogeneous sound, improved dynamics and a more precise register, particularly in the high frequencies. With a swiveling head and easy to install on a TV stand or on the wall, Dôme loudspeakers are perfect for those looking for a multichannel system without using up floor space. Additionally, with their recent launch, Focal has completely redesigned the method for in-ceiling installation of the ICW-4 with its Easy Quick Install (EQI) system, making it incredibly easy for users to install the products without any tools required after the initial hole is cut in the ceiling. With a mechanism composed of two parts, a mounting frame and the loudspeaker, the mounting frame is fixed to the wall or ceiling using mounting brackets. These have a benefit of being able to manipulate them with one hand and once fixed in place, the loudspeaker can be quickly attached to the mounting frame with a quarter-turn locking mechanism. In order to offer the ultimate flexibility for users, additional Dôme Flax speakers, Sub Air and ICW-4 in-ceiling speakers can be added to meet the needs of the individual user. 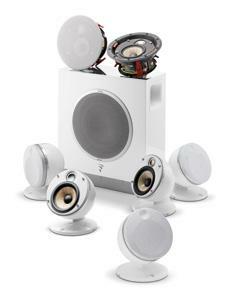 By adding these additional speakers (sold separately), users can create a 5.1.4 or even a 7.2.4 configuration very easily. The new Dôme Flax 5.1.2 system is currently available in white or black from retail and online partners for the suggested retail price of $2,499 USD ea. / $3,299 CAN ea. Additional Dôme Flax speakers and additional ICW4 speakers retail for $399 USD ea. / $499 CAN ea. • For more information, please visit Focal's website. • Focal Sopra No1 Bookshelf Speakers Reviewed at HomeTheaterReview.com.